Does your business leverage the power of Facebook apps? Wondering how other businesses are using apps to better serve their customers? Keep reading to discover many ways businesses are using Facebook apps. There are many reasons why you may want to consider using Facebook apps. They can provide communication between your customers and your customer service team, allow people to sign up for and receive your newsletter or provide your customers with special rewards. Each of these uses can help you create a deeper relationship with your customers and foster brand loyalty. If you use a fangate to conceal the content on strategic app tabs from non-fans, you can also increase the number of likes your Page is getting. In this article, we’ll explore 6 ways to successfully use Facebook apps to build the reputation of your brand and reach your customer service goals. Email remains a very popular marketing tool and sending interested users email updates in the form of a newsletter keeps them in the know about your business. Use a newsletter signup app to collect email addresses so you have an additional way to communicate with your customers when they leave Facebook. 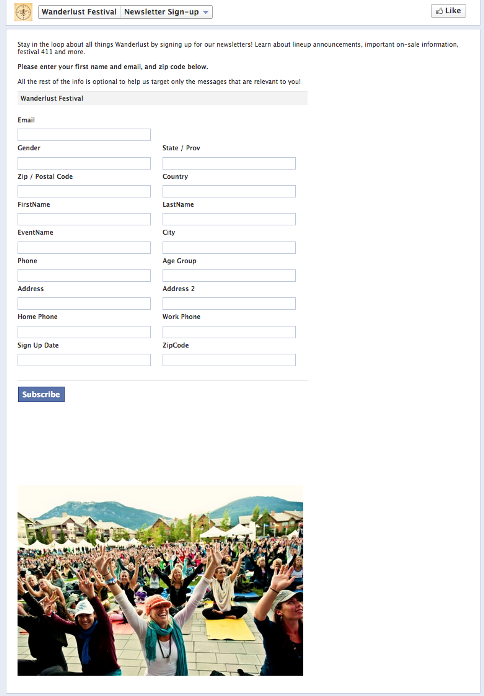 You can even ask people to like your Page to reveal the newsletter signup form. Publish status updates to tease newsletter content and then direct your fans to the app where they can sign up to receive the full newsletter. The popular yoga and music festival, Wanderlust, has events all over North America, all year long. Wanderlust uses a newsletter signup app as a way to stay connected with fans and tell them what’s happening where and when. Wanderlust’s app is nothing fancy, just a simple form to keep their fans in the loop of upcoming events. The easier you make it for people to get in touch with you, the better. Use a “contact us” app to allow your fans and customers to get in touch with representatives in specific departments within your company. This type of app helps you streamline the contact process and direct fans straight to whomever handles sales, customer support, press inquiries, etc. Don’t let your timeline become a tech support forum—move the conversation to another channel. Use a customer service app to offload conversations that don’t need to take place on your timeline. 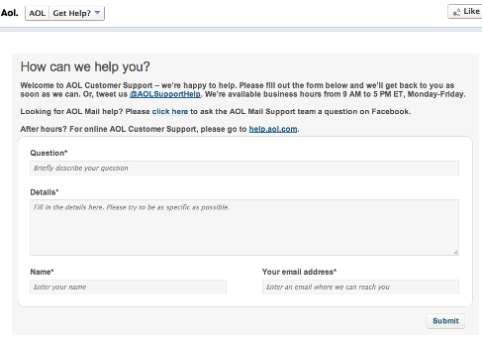 AOL knows their fans might be coming to their Facebook Page to receive customer support. To make it easier, they have built a customer service app that allow fans to submit their questions straight from Facebook. They also direct fans to their other customer support channels from within the app. AOL has an app that hosts a simple customer support form dedicated to its Mail product. Small business owners who wear many hats should definitely use an app that will allow clients/customers to request or book appointments and reservations via Facebook. You can ask for name, telephone number and times that customers want to come and then call them to book or confirm an appointment. This app is ideal for anyone who is in the service business, restaurants, hair salons, cleaning services, etc. You can also iFrame in a more sophisticated reservation system that will actually make the reservation for your customers with something like OpenTable. The Piano Bar uses their reservations app to book reservations and it also features an interactive map that directs customers to the restaurant. 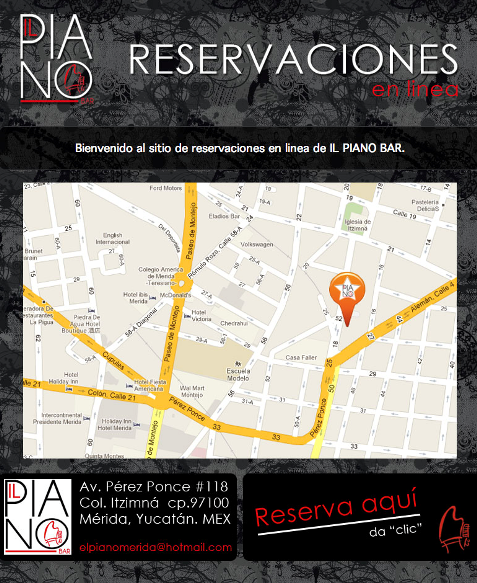 Piano Bar makes it easy for fans to find the restaurant once they’ve made a reservation. There are certain times of the year when brands and businesses want to capitalize on upcoming holidays. Halloween, Thanksgiving and the variety of December holidays (Christmas, Hanukkah, New Year, etc.) are the obvious ones, but there are plenty of others throughout the year. In the U.S., there are always huge retail sales events for President’s Day, Memorial Day and Labor Day weekends. Then there’s Valentine’s Day, Easter, Mother’s Day, Father’s Day, Fourth of July… and the list goes on. Seasonal apps can feature contests, quizzes, coupons and just about anything else you might want. The California Avocado Commission uses seasonal apps as a way to keep fans engaging with their Facebook Page all year long. 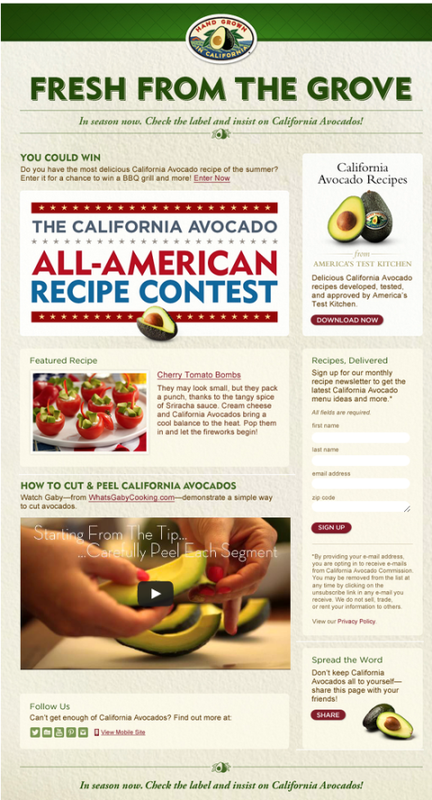 Their current “What’s New” app links to a Fourth of July recipe contest and provides resources for avocado lovers. The California Avocado Commission frequently runs seasonal contests. This one was for the Fourth of July. Reward your loyal fans and customers with access to special deals with a “Facebook exclusive” app. 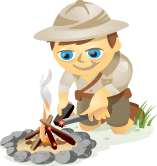 Ideally your fans will get into the habit of checking your Page to see if there are offers available only to them. If you’re an e-tailer, you can even link fans from the app to your website where they can buy the deal. 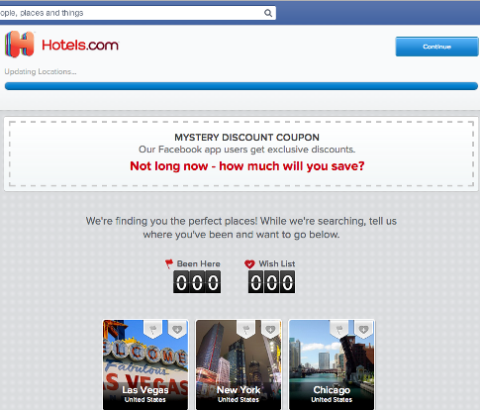 Hotels.com offers a “Mystery Discount Coupon” that fans of the brand access from its Facebook Page. Wouldn’t it be cool to discover that your favorite hotel in San Francisco was having a $79 a night special? When you first come to the Hotels.com app, they request access to your Facebook Page and then start searching for a deal in your area. 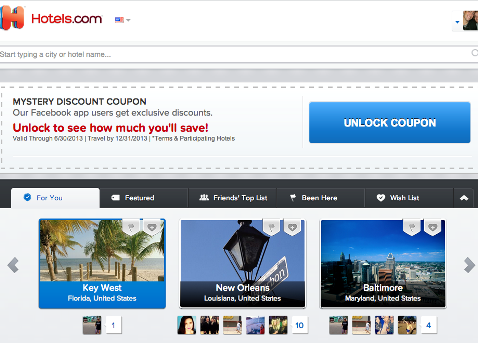 Hotels.com offers a mystery discount coupon to its fans. Use a testimonials app where your customers can leave detailed feedback about their experience with your business. This feedback will give you valuable insight into what your existing customers like about your business and products, and what they’d like to see in the future. It’s also a place where they can leave suggestions for things you could do differently. Your customers’ feedback is essential. Your customers tell you what they like about your product or services and what they don’t. They may also make requests for features they’d like you to add or other changes they’d like to see your company make. Mutiny Kites, a top quality kitesurfing company, uses a testimonial app to hear about their kites’ performance from their customers. They also list the testimonials they’ve received from other satisfied customers on the same app. Offering potential customers testimonials and customer feedback can help influence their buying decisions. 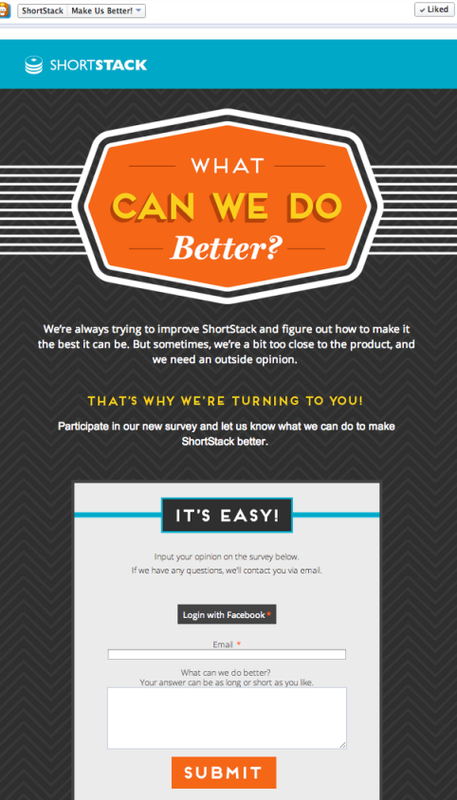 ShortStack fangates their testimonial app to grow their fan base while accepting feedback from customers. Once fans “Like” ShortStack, they can give their suggestions for the platform. These are just a few ongoing ways you can use Facebook apps to achieve your business goals. Consider using the apps that best suit your needs. If you want to get started using Facebook apps, here is a comprehensive list on third-party platforms. Many businesses are using apps every day to create stronger ties with customers and to increase the lines of communication. What do you think? What apps have you tried? Is there one that you think every business should consider? Leave your questions and comments in the box below.